CAUTION: Wear plastic gloves when working with peppers. Do not touch eye area. To prepare fresh jalapeño peppers: Rinse, cut in half lengthwise, remove seeds and stems, place in boiling water and remove after 2 minutes; drain well. To prepare canned jalapeño peppers: Drain, cut in half lengthwise, and remove seeds and stems. Fill each pepper half with cream cheese until slightly rounded. Place 1/2 cup flour in separate bowl, set aside. In a second bowl, beat egg with milk. In a third bowl, prepare breading by combining bread crumbs, onion salt, garlic salt and oil. Stir in flour and sugar until mixed thoroughly. 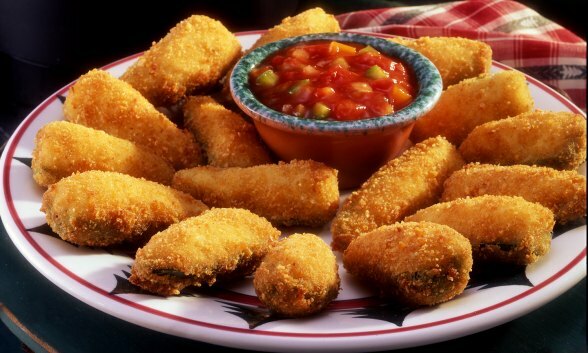 Roll each pepper in flour, dip in egg mixture and then cover with breading. For a heavier breading, dip in egg mixture again and cover with breading a second time. Gently set aside until ready to deep fry. Preheat oil in Presto® electric deep fryer. If using an adjustable thermostat deep fryer, set at 375°F. Deep fry approximately 1 to 2 minutes or until golden brown. (Tip: Remove immediately if cream cheese filling appears through the coating.) Drain on paper towels. Serve warm. If desired, serve with salsa. FOR A MILDER VERSION: Substitute green peppers in place of the jalapeño peppers. Cut pepper into small portions, maintaining the curved shape to allow each portion to be filled with cheese filling. Place peppers into boiling water and remove after 5 minutes; drain well. Fill and coat as directed above. Fry approximately 2 to 3 minutes or until golden brown. *Reference your deep fryer instruction folder for amount of oil needed. Batter may also be poured slowly in a circular pattern into hot oil from a 2-cup glass measuring cup.